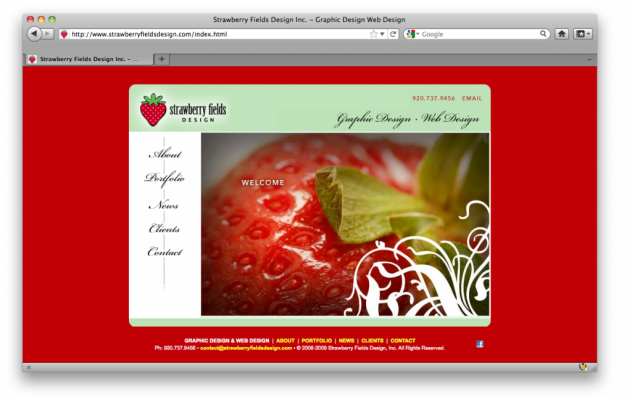 GREEN BAY, WI – It’s been a very fruitful year since Strawberry Fields Design was incorporated in February 2006 – new clients, new projects and a brand-new Gold ADDY® Award for the website, www.StrawberryFieldsDesign.com. The Gold ADDY® Award was presented to freelance graphic designer Addie Sorbo for her Strawberry Fields Design website on Friday, March 2, during the Fox River Ad Club ADDY® Awards at the Radisson Paper Valley Hotel in Appleton. StrawberryFieldsDesign.com was also nominated for the Best of Show Interactive Award. Sorbo won ADDY® Awards in 1999 and 2000 while working as a graphic designer at the Weidner Center. In 2000 she was named visual communications manager at the Weidner, a position she held until last year when the University of Wisconsin-Green Bay, which owns the Weidner Center, decided to end programming for the facility. When she incorporated her business last year, Sorbo said at first she was focused on her clients rather than self-promotion, and settled for a template-style website that she realized was not showing her best assets as a designer. Strawberry Fields Design prides itself on making a good first impression for its clients through eye-catching design that makes a statement. Their client list includes a wide variety of businesses – from realty companies and clinics to retail outlets and entertainment venues. The name of Sorbo’s business reflects her longtime passion for The Beatles. The strawberry theme is put to particularly good use on Sorbo’s award-winning website. The American Advertising Federation, a not-for-profit industry association, conducts the ADDY® Awards through its 200 member advertising clubs and 15 districts. It is the only creative awards program held by the industry for the industry. Sorbo sees her award as an affirmation of her design and business skills.